In Social Transformation in Post-Conflict Nepal: A Gender Perspective, Punam Yadav explores the unintended positive impacts of conflict on the position of women in Nepal, drawing on comprehensive interviews with 57 women. The book is a compelling and accessible must-read for those researching social transformation and gender in post-conflict societies, writes Ashleigh McFeeters. This review was first posted on the LSE Review of Books blog here, and is republished to coincide with a public panel discussion taking place on Tuesday 8 November. 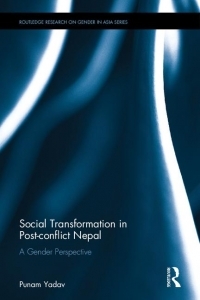 Social Transformation in Post-Conflict Nepal: A Gender Perspective outlines the enabling and emancipatory potential of conflict for previously marginalised groups, such as women in the case of Nepal. As conflict is no longer an abstract notion touching self-contained faraway countries but a global issue, and gender inequality is still making the headlines in the so-called developed Western World with the gender pay gap, Punam Yadav’s book makes for compelling reading. Yadav argues that the intangible concept of social transformation cannot solely be measured through the top-down approach of structural and institutional recalibration, but must be understood through the subjective lived experiences of individuals. Yadav sets about doing this by conducting 57 comprehensive interviews with women during the flux of the aftermath of the ten-year People’s War in Nepal (1996-2006). The participants represent the cross-section of ethnic and caste groups in Nepalese society; within this sample, four new categories of women that had arisen due to the war were identified: female Constituent Assembly members; female combatants; war widows; and female tempo (three-wheeler taxi) drivers. Yadav’s argument is that women’s occupation of these non-traditional positions defies the expectations and assumptions of womanhood. Consequently, this has led to transformations within the women themselves through increased confidence as well as respect throughout the community and the greater representation of women at the political level. Women became aware of inequity and felt empowered to contribute to change. One participant is quoted: ‘I was against all sorts of discriminations such as discrimination based on castes and gender, violence against women, polygamy, and regional discrimination […] I wanted to do something about that and that’s why I joined politics’ (101). Yadav illustrates this argument of transformation in the chapters dealing with each of the four categories, two of which are summarised below. The radical shift in the image of womanhood is exemplified in Chapter Six, ‘Women Combatants: Challenging Habitus’, where Yadav explains that the visibility of women undertaking traditionally masculine combat roles has contributed to transforming rigid gender roles and conventions. The crises of the People’s War forced women to undertake things that they would not have done pre-conflict; subsequently, these new roles have caused women to question their former lives and the discriminatory practices that targeted females. Yadav notes that the women realised that their situations were not fixed or unchallengeable, but that they could change them themselves through collective action: as the participant Narbada asserts, ‘we are coming together to make our voice stronger’ (151). Yadav balances excerpts from participants’ testimonies with theoretical scrutiny influenced by Judith Butler, Pierre Bourdieu and Michel Foucault to lucidly unpack the significance of the women’s experiences within the landscape of social transformation. Furthermore, Chapter Eight, ‘Women Tempo Drivers: Challenging Doxa’, explains how the influx of displaced people into Nepal’s capital city, Kathmandu, forced women to take up the previously male-only occupation of driving tempos due to the lack of jobs and demand for transport. As women’s participation increased, so did its acceptability. Furthermore, women grew in self-possession and self-assurance by acting outside of their comfort zone: ‘Initially I wasn’t confident […] I found it very difficult in the beginning but later got used to it and now I find it easy’ (149). Yadav uses this example to show how the war necessitated women to move from the private domestic sphere to the public one. The aforementioned examples of Yadav’s extensive analysis of these women’s accounts of their experiences chronicle the empowerment capacity of war by illustrating how these women have taken on new roles that challenge the status quo of Nepal’s highly gendered society. Yadav asserts that the presence of women in combat dress or driving tempos, whether in real life or the news media, has changed people’s opinions and normalised it in society so that women are now accepted in non-traditional roles. Having reviewed the main arguments of the book, what follows are constructive suggestions for expanding this investigation. Yadav’s research opens up the conversation about equality generally, and it would be interesting to observe whether the aphorism ‘a rising tide lifts all boats’ is occurring amongst Nepal’s caste and class systems. Moreover, Yadav makes fleeting reference to the news media’s impact. As this has a significant role in creating, maintaining and reinforcing stereotypes and beliefs about certain groups, further analysis may reveal more about how the images and depictions of women have changed and what effect this has had on society. Understandably, the capacity of the book only permits detailed analysis of one country; however, comparison with other post-conflict nations such as Sri Lanka, where women undertook previously male-only roles (Birds of Freedom in the Liberation Tigers of Tamil Eelam), may bring to light common patterns in social transformation. Relatedly, it will be interesting to witness if the burgeoning gender revolution gains traction as Nepal moves further away from its violent past or if, like Algeria post-independence, women fighters are sent unceremoniously ‘back to the kitchen’. In conclusion, Yadav avers that the conflict was a catalyst for the social transformation of Nepalese communities, especially for the case of women: ‘the change in political context due to the People’s War proved to be fertile ground for women to participate in politics’ (163). Before the war, the interviews reveal that women were dependent on men, but now, having been involved in new activities and having witnessed independent female role models, they want to do things for themselves. This has caused a shift in mindset about how women are viewed by society and in how they view themselves. Yadav claims that the war has opened up space for negotiation and fluid discourse, and due to this changing political narrative, women have been included in the political agenda and have contributed to the Constitution of Nepal. This book would be of interest to anyone researching the revolutionised landscape of gender in the social transformation of post-war societies. It will appeal to the academic and practitioner alike, and could be used as part of a nascent ‘how-to manual’ for NGOs, whose progress is currently measured by Western evaluations of desirable end goals for development. In contrast, Yadav looks at the effects – including the unintended and unforeseen positive outcomes – of armed conflict. Yadav’s work is a much-welcome bridge between social transformation and gender, and fits in with current research on female leadership in societies recovering from violent ethnic conflict and female ex-combatants’ contributions to peace-building. Overall, this book is a personal and accessible account of women’s lives without the usual wholesale pandering to the victim storyline, and is a must-read for students researching revolutionary genders in communities emerging from conflict. This post was first published on the LSE Review of Books blog. Ashleigh McFeeters is a third-year doctoral student pursuing a PhD under the supervision of Prof John Brewer, Ms Julia Paul and Prof Paul Simpson at Queen’s University Belfast in Northern Ireland. Her current research interests involve post-conflict peace-building and nation-building, the news media and politics, gender politics and female terrorism.